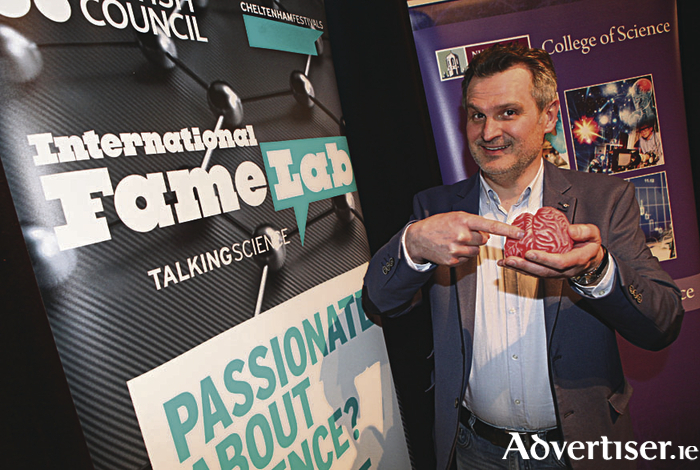 Pictured is Professor Michel Destrades, School of Mathematics, Statistics and Applied Mathematics at NUI Galway, who won the 2016 Famelab Galway Heat and was runner up of the national competition. For the second year running NUI Galway will host a regional heat for FameLab 2017, one of the biggest science communication competitions in the world. If you think you can explain a scientific concept to a general audience, in just three minutes, then why not enter? You could become the new face of science, represent Ireland at the 2017 FameLab International finals in the UK, and open doors to global opportunities in science communication. The competition is open to: people who apply science, technology, engineering or mathematics in industry or business; those who work on applying science, engineering, technology or mathematics (e.g. patent clerks, statisticians, consultants to industry ); lecturers and researchers in science, technology, engineering or mathematics, including specialist science teachers with a science degree; university students of science, technology, mathematics or engineering aged 18 and over; and those who apply science, technology, mathematics or engineering in the armed forces or government bodies. Training for entrants will take place in Galway on Tuesday, January 31, with the regional heat scheduled for Tuesday, 21 February. The event will be held at the Taibhdhearc Theatre, Galway. The application deadline to enter the competition is Tuesday, 7 February, 2017. Successful candidates who make it through the initial regional heat stage, will be invited to attend an all-expenses paid ‘Communication Masterclass’, which will take place in Dublin on the 25-26 March, to help develop invaluable STEM media and presentation skills. The FameLab Ireland Final will be held at the Science Gallery, Dublin on Thursday, 13 April 2017. The aim of each presentation is that the audience and judges should be left inspired and enthused about science. The winner will be a charismatic presenter who makes the science easy to listen to, entertaining, exciting and who is not only able to communicate the science but who can share their passion for it. Please contact [email protected] if you are unsure about your eligibility and check http://www.britishcouncil.ie/famelab/prepare-heats/regional to learn more about regional heats. Follow Famelab Galway on twitter @FameLab_Gaway.